The International Kiddush Club is excited to announce that we will hold our 7th International Convention in Danvers, MA, July 24 to 28, 2013. Registration will take place through the FJMC Convention Website. IKC Shirts with official numbers are now available. Click here for details! If you sleep during the speech after attending Kiddush Club, is that "sleeping with the fishies"? My name is Jakub (Jacob) Doman and I live in Warsaw, in Poland. Rabbi Chaim Weiner and Mrs. Joanna Kubar visit us in November, just before Hannukah. They visit us because they wanted to talk about Masorti Movement in Poland. We talk how to start and learn. When we finish our meeting, there was also my wife-Barbara, Rabbi Weiner gave me unusual gift. Rabbi Chaim gave me teffilin and I asked him to tie it. I couldn't hide my emotions in that moment. I never thought that moment will come. Rabbi Weiner wrote me a letter from London a few days later. He let me know, that Rabbi Simon and FJMC sponsored* teffilin for me. I would like to thank You, this schenk is a big honour for my person, I feel very touched. I know that gift oblige me to go to Kavanah. I decide to recolect my donors every day when I say Amidah. Dear Rabbi, I'm (a) Jew living in the City, the City where memory and reality are still together... we remember Umschlagplatz, but we are still alive and we have good Jewish life now, here in Warscha. I was rabbinical student, unfortunately I had to stop my study. I didn't have financial assets. I hope I will finish study,which is my dream. Today I'm helping my wife. She is a technical dentist, and she has her own business. We have two children, Klara (Claire) and Ernest are in private Jews school, only one in Poland. Klara is the best student, she is 13. I will never forget your big gift. I wish the best for You, Your family and FJMC. p.s. I'm sorry but my english is not good; but I study this language, I speak german. *Funds raised by your membership in the International Kiddush Club are the main source of funding for Tefillin Fund. for those who cannot afford them in Latin America & Europe. 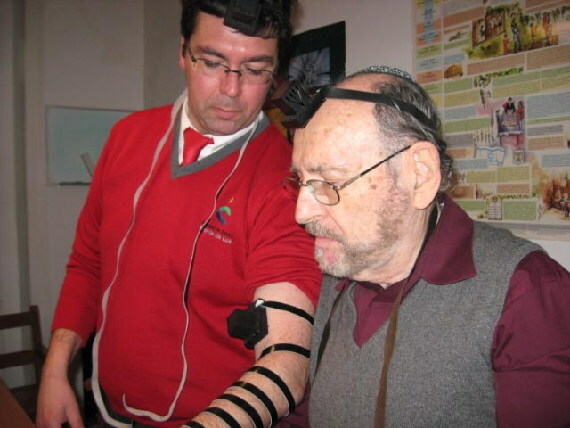 As you may know, the bulk of the money raised by the International Kiddush Club through dues and other means are given to the FJMC's Tefillin Fund to buy mezuzot and Tefillin for Jews who can not afford them in Latin America and other parts of the world. 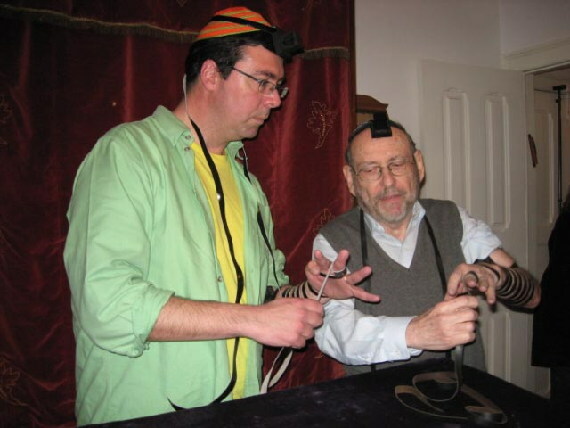 Rabbi Charles Simon (AKA "RABBIOV"), distributes the tefillin and uses various rabbis and others acting as his emissaries around the world in this task. We have surpassed $15,000 in donations to this worthy cause. Rabbi Simon recently received the following e-mail which we wanted to share with everyone. There is a group of Portuguese bnei anousim, to which my family and I belong. Last week we studied with Rabbi Jules Harlow and his wife Navah on the Passover Haggadah. We were listening with attention devoted to the various details of the oppression of the Jewish people and their departure from Egypt when, at the end of the excellent class, I was surprised by the gift of a beautiful set of Tefillin and his handsome case, brought to me by the Harlows. They told me that it was a gift from the Federation of Jewish Men's Clubs. My astonishment was great, a mixture of amazement and total surprise for the wonderful gift. 513 years after the forced conversions, persecution and terror of the Inquisition that lasted in Portugal for 300 years and resulted in a cultural genocide unprecedented in the Jewish and New Christian era, here's what I felt at that moment and at this very time that we're approaching Passover ---- a personal liberation, equal to the Hebrews in Egypt, I was released from chains that historically tied my ancestors to a hidden underground, ignorant of their traditions. Rabbi Jules has been our guide and a "spiritual father" to open up the path to the teachings of Judaism and how to become better people in our day to day lives, with practical examples of this. In the last Kabbalat Shabbat, Rabbi Jules and Navah focused on the Mitzvot shebein adam LaMakom and Mitzvot shebein adam Lehaveró, an interesting reference to the relationship between man and God and between all men. We learned that our Jewish tradition teaches us values. It is the lighthouse before us that shows us how to become better human beings and shows us the future of our lives. And in my particular case, I feel a greater responsibility now in this journey that I started with my classmates. Your present is fraught with meaning, not only because it reveals an enormous capacity "to love", but it also indicates "receive, transmit and learn to honor" an ancient heritage of more than three thousand years. Once again, and do I need reaffirm it, thank Rabbi Jules and Navah Harlow, for your wisdom and willingness to come to Lisbon to teach us everything that was lost in this country, and the person of Rabbi Chuck Simon, which enabled in a unique and proud to send this gift of the Tefillin, and so, so strong in this act help to reaffirm my way up to the people of Israel. Hotmail: Serviço de correio electrónico gratuito, fidedigno e completo. Obtenha-o já.